Puresight has launched the iRobot Roomba 671 in India for Rs. 37,900. The 671 is Wi-Fi enabled, supports IFTTT recipes and can be controlled using Amazon Alexa. The newest addition to the iRobot Roomba line of robotic vacuum cleaner is the model 671. It comes with Wi-Fi built-in and has support for Amazon Alexa and IFTTT to schedule cleaning sessions in a smart manner. The Roomba 671 sports an MRP of Rs.37,900 and comes with a 2-year warranty for the unit while the battery has a 1-year warranty. The Roomba 671 will sport a launch price of Rs.29,900 for a while. Cleaning your floor is always a tiring job. You have to somehow get your vacuum cleaner to go below the bed, under the couch, over the rug, and steer it through the narrow passageway between chairs beneath the dining table. And after all of your hard work, you finally press a button to switch on the TV and another to switch on the AC. Lastly, it is time to relax! But what if you were able to press a button to switch on the TV, one for the AC, and another for your vacuum cleaner, all at once? You’re comfortably seated while your home gets cleaned all by itself. Does it sound like a dream? Now, this dream has become the very reality. Puresight Systems Pvt. 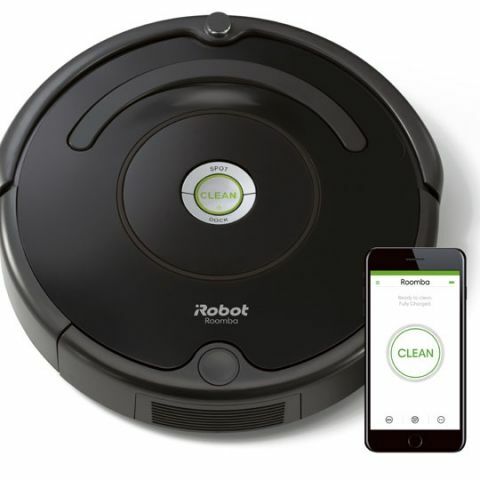 Ltd. who are the official distributors of iRobot products in India has launched their all-new robo vacuum cleaner Roomba 671 in India. Roomba 671 is a high performance & Wi-Fi® connected robotic device that seamlessly navigates throughout your house, including hard-to-reach, under-couch and below-bed areas and help you keep up with everyday mess. Just press CLEAN button and Roomba 671 goes to clean your floors. You can bring home the smart device via Amazon.in, iRobot’s India website, and iRobot’s offline retail outlets. So, let’s have a look at Roomba 671 and the comfort that it brings in maintaining your ultramodern lifestyle. The MRP of Roomba 671 is Rs. 37,900 however, the launch price is kept as Rs. 29,900 and it is the lowest priced product in the connected Roomba vacuum robots segment. Roomba 671 is a disk-shaped vacuum cleaning robot that features a radical design and elegant aesthetics. The visually-stunning device has a sleek and slender body (with 9.2 cms of height) that enables it to easily navigate through the household furniture and thoroughly clean critical areas, including below-couch and under-bed regions. Roomba 671 also has a specifically-designed edge sweeping brush to ensure that dust and debris is easily cleared from the often-unchecked room corners. The device is assisted with the Home Base Charging Station – its turbo-charging cradle – where it automatically docks and adds to the overall visual appeal of your home. Roomba 671 has a 3-Stage cleaning system that comes with a powerful suction that and help to thoroughly clean floors. The device effectively cleans and identify high-footfall regions that need more thorough cleaning. Its AeroVac filter also uses tangle-free, multi-surface brushes that can even remove embedded dirt besides dust, mites, and allergens. Wi-Fi enabled Roomba 671 can also be controlled while you’re not at home via its iRobot HOME App and you can prefix scheduled cleaning using the same. This device is compatible with smart home assistants such as Amazon Alexa, thereby enabling them to be voice-controlled. The high-performance device delivers a continuous cleaning action for one hour and automatically returns to its Home-Base charging station to recharge or when the home cleaning is complete. Dirt Detect Technology: Roomba 671 is developed using iRobot’s patented Dirt Detect Technology that automatically recognizes high-footfall regions that are more prone to dust accumulation. iAdapt Navigation: The device also comes loaded with the brand’s proprietary iAdapt navigation that uses a suite of smart acoustic and optical sensors that add to the device’s overall performance and navigation. It also enables the iRobot to make 60 decisions/per second. 3-Stage Cleaning: Its Edge-Sweeping Brush sweeps debris away from edges and corners. Multi-Surface Brushes work together to lift dirt, dust, and hair from carpet fibers and hard floor surfaces. Vacuum suction works to pull in dust, dirt, and debris. iRobot Home App: Being a Wi-Fi enabled model, Roomba 671 connects to clean from anywhere. Preset to clean on a schedule, up to 7x per week. Check the status of cleaning and monitor. Receive cleaning reports through the iRobot home App. Get App-based support. Amazon Alexa and IFTTT Compatible: The device is compatible with Amazon’s Alexa home assistant to be voice-controlled from anywhere inside the home. It can also be manually programmed with web-based service IFTTT (If This, Then That) which enables its users to develop conditional statements such as “Make Roomba start cleaning after I switch off the TV” with all platforms, services, and products supported by IFTTT. ⦁ 2 Years Warranty Card provided by Puresight Systems Pvt Ltd. In India, Roomba 671 is backed with 2 years of warranty on the robot vacuum and 1 year on the battery. The iRobot Roomba 671 can be purchased from iRobot’s showrooms across Bengaluru and Chennai, or from the iRobot India website (https://irobot.in).